Craft Beer Rising at the Old Truman Brewery – a sign of things to come? The modern British beer landscape is rich, exciting and diverse. Traditional CAMRA-organised events, with rows of tilted casks and hi-vis-jacketed stewards are no longer the norm. We now have a variety of species of beer festivals. There are those put on by individual pubs (like last year’s CAMRGB takeover at The Lamb on Holloway Road), where a special selection of beers are brought in for a weekend. There are painfully trendy, street food-oriented outdoor events, like this week’s #BrooklynFeast in Dalston (where else? ), which are pre-hashtagged for your social media convenience. There are also events that try to do a little bit of everything. Just a couple of weeks earlier, Craft Beer Rising took the beer blogosphere by storm and established itself as the new must-visit event of the British beer calendar. It couldn’t have been more different to the London Drinker Beer and Cider Festival, or the Great British Beer Festival (GBBF), CAMRA’s yearly beer bash. Fewer beers may have been on offer, but there was a wider variety. Cask, keg and bottled beers were present from breweries all over the UK and the world. The trend for street food was both acknowledged and catered for. Real ale, craft keg and much more were all included as part of the same experience, and the crowd was just as varied, in both age and gender. I wrote about Craft Beer Rising recently in Rum & Reviews, and I must admit I got rather excited about how it represented what I thought beer festivals should be all about. Before I went to the London Drinker event, I thought to myself, ‘Ha! Let’s this how this measures up!’ thinking that it would seem pale in comparison to Craft Beer Rising. 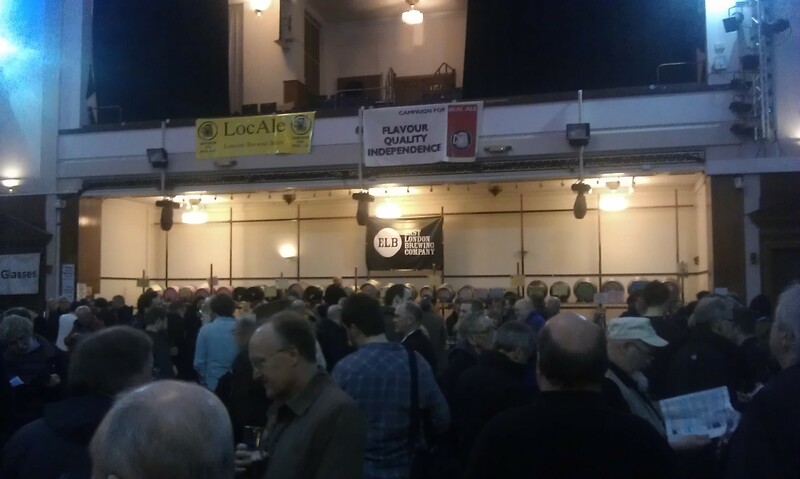 The CAMRA London Drinker Beer & Cider Festival. Proof that traditional beer festivals are still popular. However, north London’s CAMRA beer festival is still going strong. The London Drinker event last week, in its regular home of the Camden Centre near Kings Cross, still had a big draw. Beer bloggers, beer tickers, old timers, young whippersnappers and brewers great and small made up a large portion of those attending. This was a CAMRA event though, and while women were more than welcome, many did not seem to feel welcome enough to actually attend. The beer was served to much higher standard than I remembered, though the London bar seemed to have the lion’s share of the best beers. The main bar seemed to be 70% golden ale, and didn’t have nearly as many people drinking at it with ‘bloody hell that’s good’ faces. Unfortunately, the food offering was pretty basic, and shared space with the foreign beer bar. Some real treats were hidden away here though, particularly the mini-casks of Schlenkerla Marzen (liquid smoked bacon) and other German beers. It wasn’t as much fun as Craft Beer Rising, but I can’t say that CBR was better either, as much as I would like to. These are two completely different events, and I expect #BrooklynFeast on Tuesday to be just as different again. I would be wrong to rank the UK’s beer festivals by how ‘good’ they are. Beer festivals are very subjective, individual experiences that appeal to tastes and personal preferences. The Celtic Beer Festival is completely different to GBBF, just as Wandsworth Beer Festival is to London Drinker, and just as the BrewDog AGM is to Craft Beer Rising. If CBR seems to be the better event, it might be because it adopts positive features from each of the above, and tries to do a bit of everything, and does it well. If this is a trend is on the rise (sorry), then I welcome it. We all get the beer festivals we deserve. The fact is that each of these events is just as important. Each of them demonstrate the thrilling diversity of the British beer landscape, and we should recognise that each and every one is something to be proud of. Previous Previous post: No Future – is beer innovation a myth?